Last Sunday, I finished my Molly Ringwald. This was a lovely pattern, and I learned a lot in the process. It is full of elegant little design touches, like the way the ruffles are formed or the transition from the bust to the sleeves. Because it is relatively simple, I knew finishing would be important. 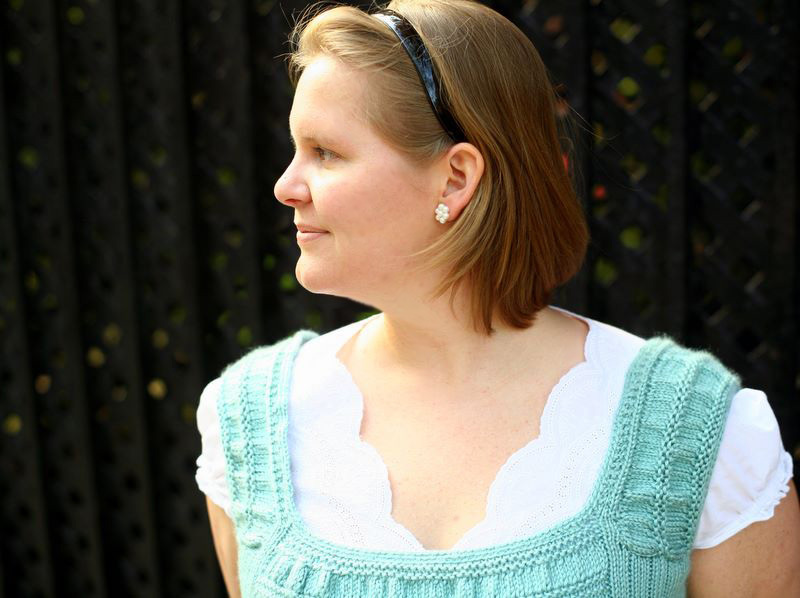 I was very careful with my seaming, and while I was tempted to avoid learning how to crochet for the neckline, it is now one of my favorite details. 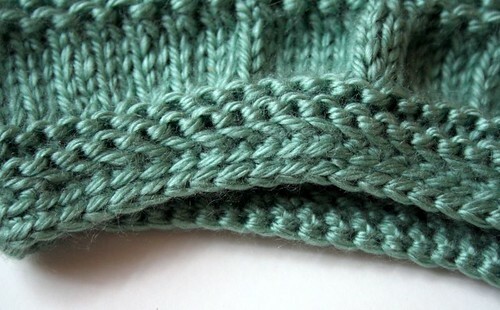 I like the clean, sharp edge so much that I crocheted around the armscyes as well. This is definitely a good skill to add to my knitter’s toolkit, as I’m sure I’ll use it again. 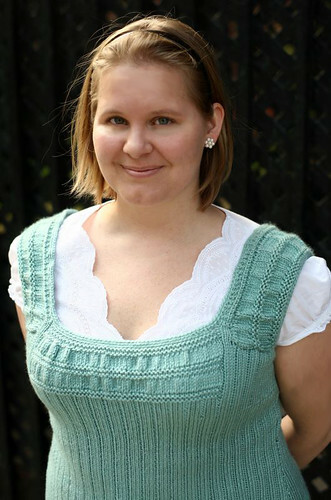 I really admired the way the sleeves were constructed, and that is another trick I plan to remember: the front neckline stitches are reduced down to 4 stitches on each side, and these are knit into a ribbed strap which extends over the shoulders and attaches to the back. Once the body is sewn together, you pick up stitches from this edge and knit outwards to form a pretty little shoulder. I imagine it would not be at all difficult to extend this to a cap or short sleeve. Way cute. There were a few times when the 3×1 ribbing became maddening, but mostly I zoned out and got into the Zen of it. It was a good companion project for reading, or in this case, listening to the audiobook of Alice’s Adventures in Wonderland by Lewis Carroll for the Knitting 19th Century Novels group. I’d been wanting to knit this top for a while, but when I envisioned it as Alice’s pinafore, I couldn’t resist bumping it up to have something cute for spring. 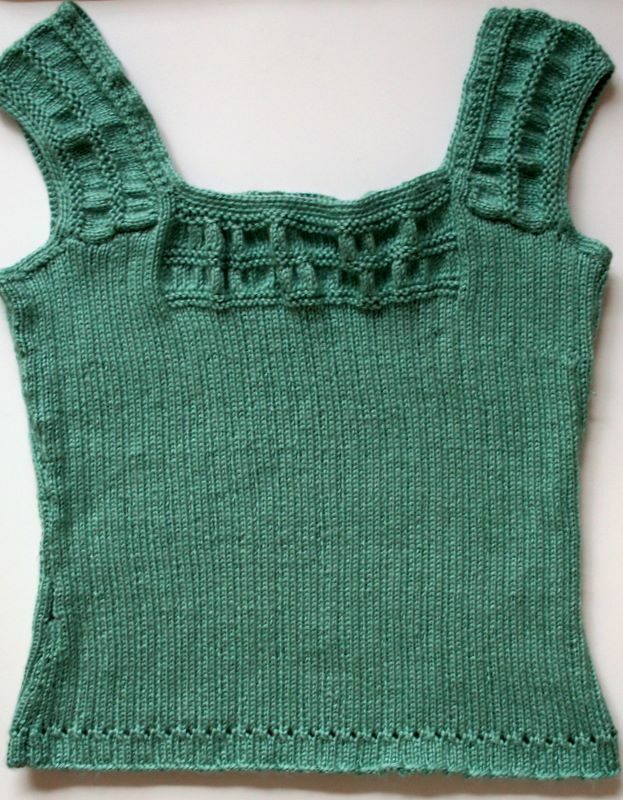 As I mentioned in my last post, I am completely entranced with this particular shade of soft bluish sage green, and I’m sure this won’t be the last project I knit in this color. The yarn was lovely to work with, and it’s soft and comfortable to wear. This was my first time using Satin, and it was just perfect for this project. I do think I could have gone down a size. 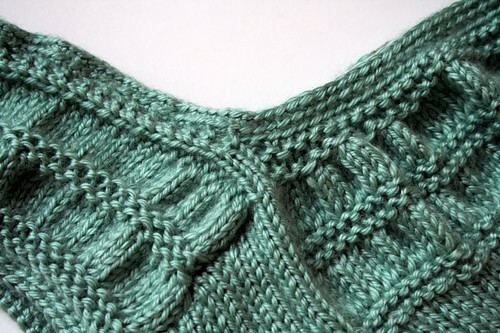 I’ve come across quite a few people online who’ve said there is a lot of ease built into the pattern, but I thought I’d rather have something slightly loose than too tight. I would definitely recommend this pattern. It’s a lot of fun and a great learning experience. I think the effort I put into the finishing details really paid off, and overall I think this is a sweet top. I will probably not wear it with puff-sleeved embroidered shirts all the time, but I think it will still carry some of that charm with simpler styles too. 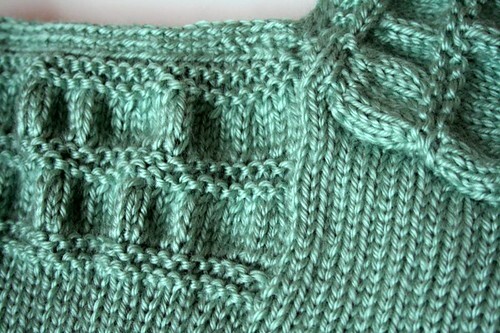 Now for my next sweater, something without ribbing! My mom always says that you achieve greatest personal growth outside of your comfort zone. I expect I should be growing quite a bit then. This past week I came down with a pretty nasty sore throat and chest cough. Frankly, I blame undergrads. Somehow, nighttime formula Robitussin – by which I mean the super extra-drowsy kind with all kinds of warnings – does not make me sleepy. Not even remotely tired. In fact, it makes my heart race and gives me insomnia. Meanwhile non-drowsy daytime sinus decongestants or heck, those sugar-free vitamin C cough drops, make me want to pass out in a drooling coma. My point is that I’ve had a lot of time when I’ve been not sleeping and feeling lousy. 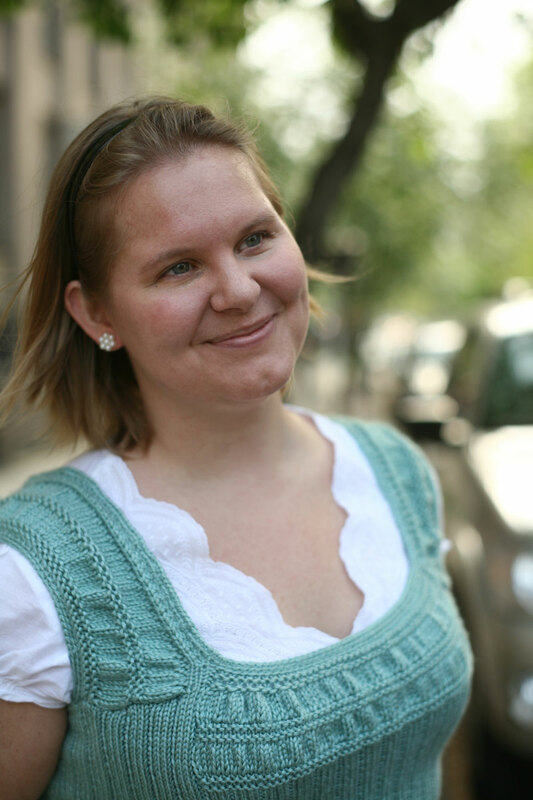 Knitting has been my primary means of preserving sanity. 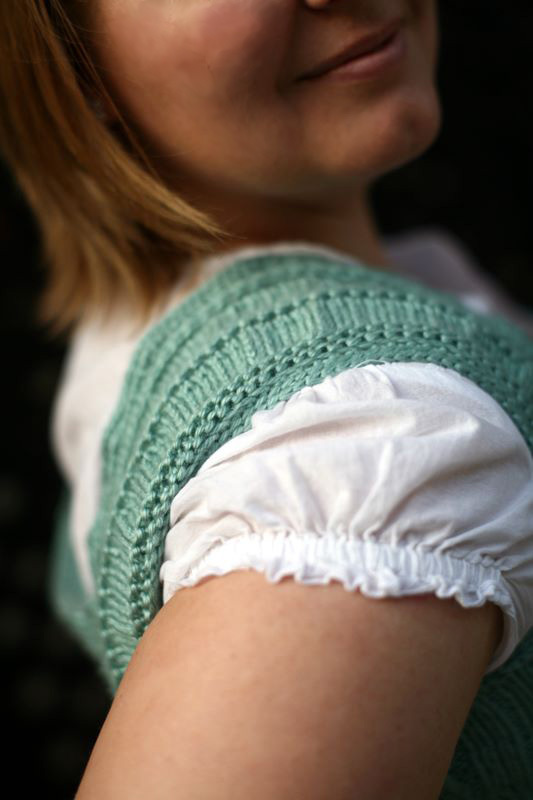 I cast on Molly Ringwald, from the Fall 2006 Knitscene, and it’s coming along nicely. 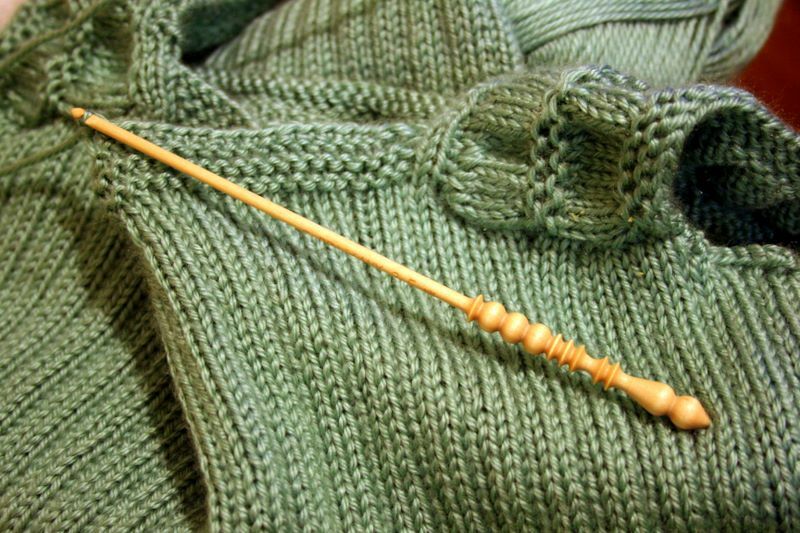 I’ve been trying to figure out why I like the color of this yarn (Bernat Satin in Sage) so much, and I think it’s because it reminds me of ground malachite, my favorite pigment in painting (when ground it’s more like this). I just wish all this 3×1 ribbing would go faster!